John Elliott Woolford’s wash drawing of 1817 is the best early pictorial record of Uniacke Estate. It depicts the view looking out over Lake Martha toward the house, the boat house on the shore and the unique barn in the background. Woolford, a well-known London landscape artist, was also a topographical draughtsman and architect. In the early 1800s, he traveled to Nova Scotia extensively with Lord Dalhousie as an official draughtsman. Using line-and-wash drawings, Woolford recorded the towns and villages, landscapes, forests, rivers, lakes and historic sites he encountered. 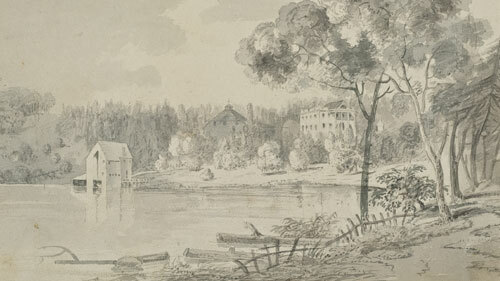 Woolford's sketches and watercolours captured Nova Scotia's changing landscape just prior to Joesph Howe's slightly later rambles across the Province. For a complete biography of John Elliott Woolford, visit the Dictionary of Canadian Biography online.